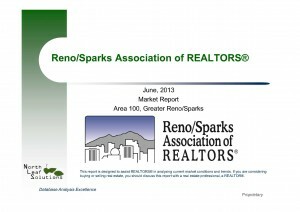 RSAR came out with the June real estate market stats for Reno/Sparks. Below is an overview of the major points with the full report available by clicking on the picture to the right. There were 717 new listings. Down 5.8% from the previous month and up 7.2% from June 2012. 76% of these were regular sales which are good for everyone. Month’s supply of inventory went up to 3.9 months. Still in a strong seller’s market. Posted in For Buyers, For Sellers, Market Update and tagged reno home market stats, reno inventory stats, reno real estate rising prices rgj, reno real estate time to sell.